You can stop right here if you have been looking for an air ambulance in Miami, Florida. Our medical logistics coordination agency was originally founded in 2004 because we wanted to fill a very important void. If you find out that you need to travel a considerable distance to receive medical treatment, where do you turn? This was traditionally a tough question to answer, but ever since we have been on the scene, air medical transport help is always just a phone call away. There is no doubt about the fact that Miami is one of the most important and exciting cities on the entire planet. The skyline is truly mind-boggling, and of course, there are world-famous beaches like legendary South Beach that can be enjoyed to one extent or another all year around. Given the climate, it is a haven for golfers and people that enjoy other outdoor activities, and cultural opportunities abound. It is a fantastic place to call home, but medical issues can arise even if you live in a tropical paradise. This is where we can enter the picture to provide assistance if you ever need an air ambulance as a Miami, Florida resident. Regardless of the distance or the nature of the in-flight assistance that you will need, we can custom craft a solution to get you where you have to go safely, efficiently, and affordably. 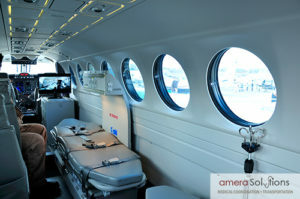 Plus, a dedicated aircraft is not the only option that we offer when it comes to air medical transport. Sometimes, an individual with some type of health challenge can travel on a commercial flight with the appropriate level of medical assistance. We would be more than glad to provide a qualified medical aid, a CNA, or a registered nurse to provide assistance while you are en route. When you place your trust in Amera Solutions, you will get top-notch, world class service every step of the way. We fully understand the fact that air transport issues related to health problems can be very stressful, and we do everything possible to ease the burden and provide the ideal solution. Plus, most of our clients are pleasantly surprised when they hear about our pricing for Miami, Florida air ambulance services. If you would like to discuss your air medical transport needs with a knowledgeable member of our team, we can be reached by phone at 855-263-7215.